be quiet! has expanded its product range to add three All In One liquid coolers called Silent Loop. be quiet! 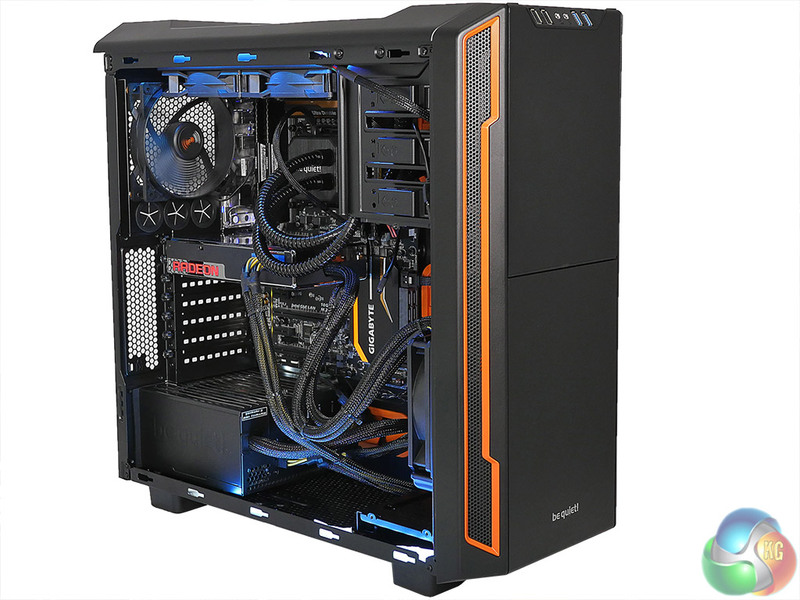 already lists cases, air coolers and power supplies so liquid coolers are a logical next step. 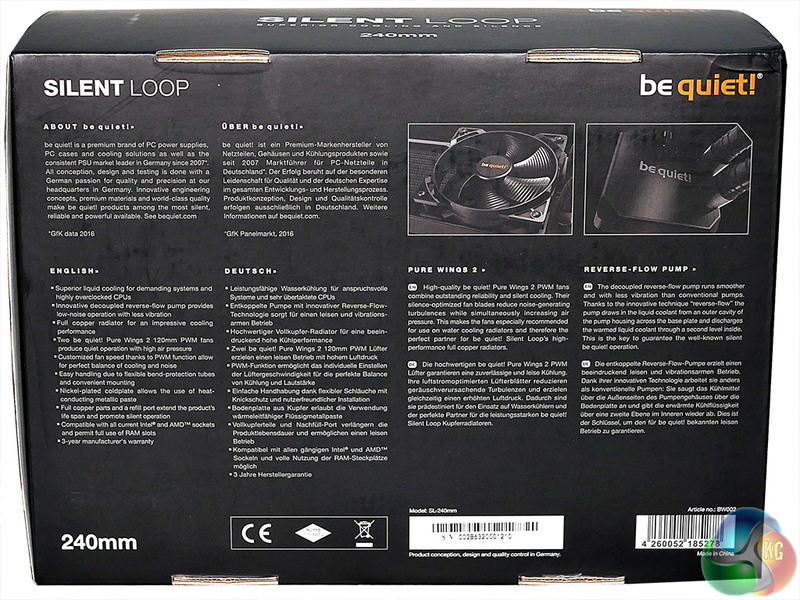 It seems appropriate that Silent Loop is designed by German company Alphacool for its German neighbour be quiet!. Specifically we see that Germany is responsible for ‘Product conception, design and quality control’ although Silent Loop is actually manufactured in China. Silent Loop comes in three sizes. This 240mm model has a 30mm radiator thickness and is supplied with two 120mm be quiet! 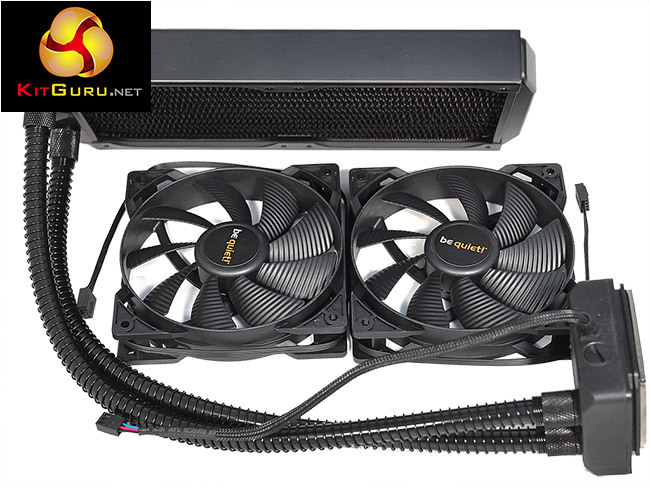 Pure Wings 2 fans that gives the system a 350W cooling capacity. 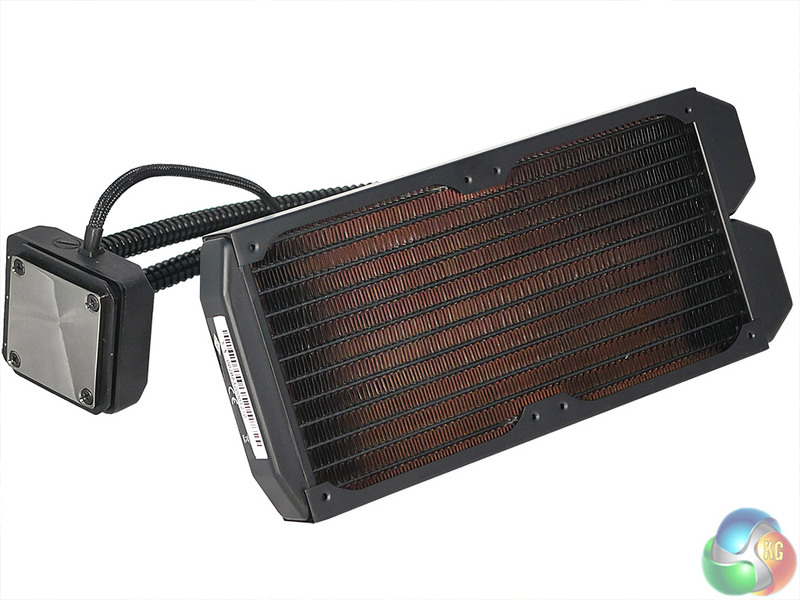 The 280mm version costs £129.99 and uses the same 30mm radiator core as the 240mm with an increased rating of 400W. 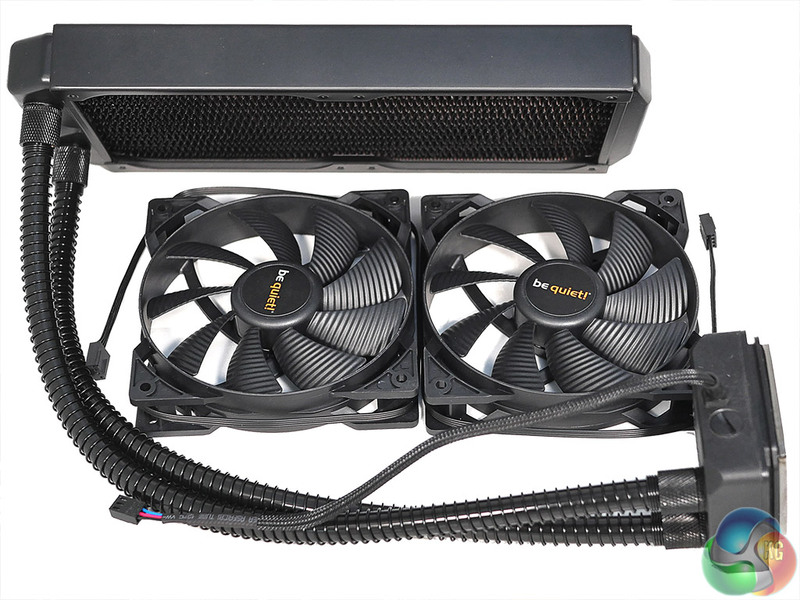 By contrast, the 120mm tiddler has a thicker 45mm core with dual fans in push/pull (a similar configuration to Corsair H80i v2), costs £94.99, and can handle 270W. 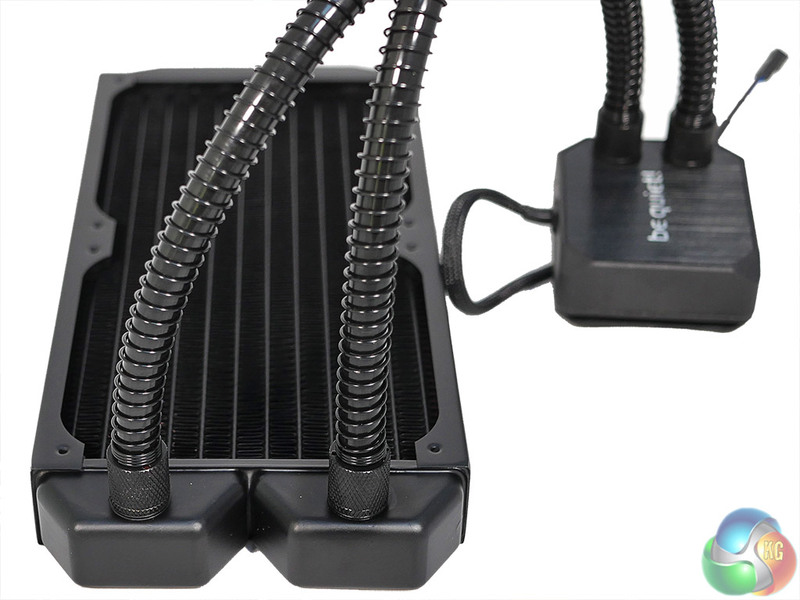 One headline feature of Alphacool hardware is the copper used in the radiator and the water block on the CPU. We know that copper is a superb material for conducting heat and it also gives the hardware some weight and heft that makes it feel more substantial than a cooler based on an aluminium heat exchanger. Alphacool was responsible for Fractal Design’s Kelvin All In One coolers that come in 120mm increments (T12 uses a 45mm core, S24 and S36 use a thinner 25mm core) and the CPU mounting mechanism looks very similar. The hold-down plate on the CPU water block is formed in two parts that slide into a groove on the block and then clip together. If you have ever tried to install an All In One single handed and suffered from components that fall off at an inconvenient moment you will appreciate the design details that Alphacool brings to the party. 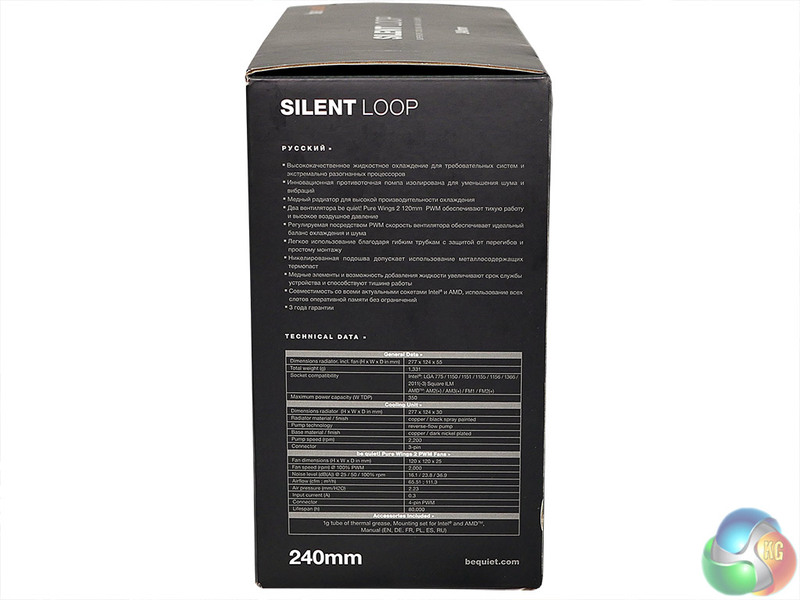 Silent Loop will feel familiar to anyone who has dealt with Alphacool or Fractal Design Kelvin hardware but there is a new feature that be quiet! is headlining with Silent Loop. This is a ‘reverse-flow pump’ that apparently runs smoother and more quietly than a conventional pump. We read their explanation and watched their video and were frankly none the wiser. 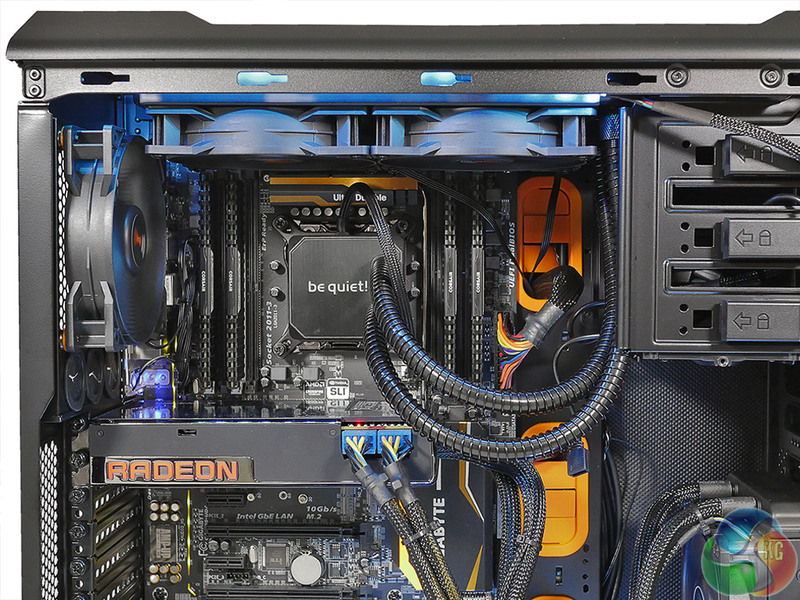 There is no denying the pump is quiet and the hardware appears to work well, but there is nothing to suggest a bold and radical new approach to liquid cooling. 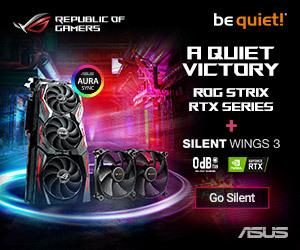 It is our guess that be quiet! and Alphacool have gone down this route to avoid patent problems with Asetek who own a significant amount of IP in the world of pump-on-block cooling systems. The quality of the hardware appears top notch including the machined face of the block and the nickel plating. There is a fill port on the block as you are expected to top up the fluid every two years, although quite how coolant might be lost is a bit of a mystery. 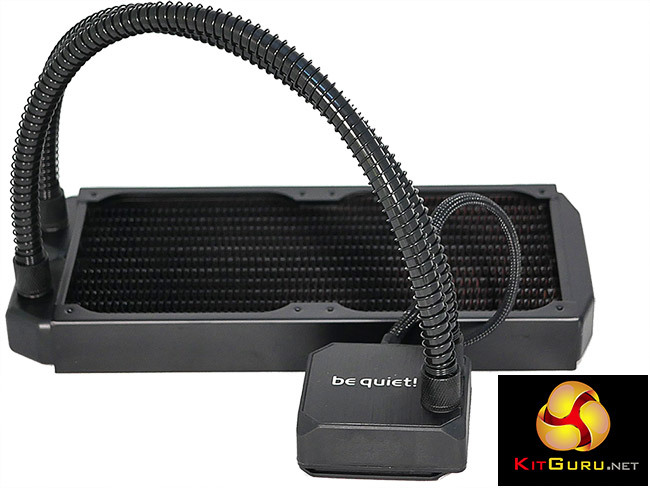 As you will see in our video, we installed the Silent Loop 240mm in a be quiet! Silent Base 600 case, rather than the larger Dark Base 900 we have previously used. The medium thickness radiator core used in Silent Loop 240mm, and the offset mounting holes in the case, mean we were able to install the cooler in the roof of the case without a struggle. 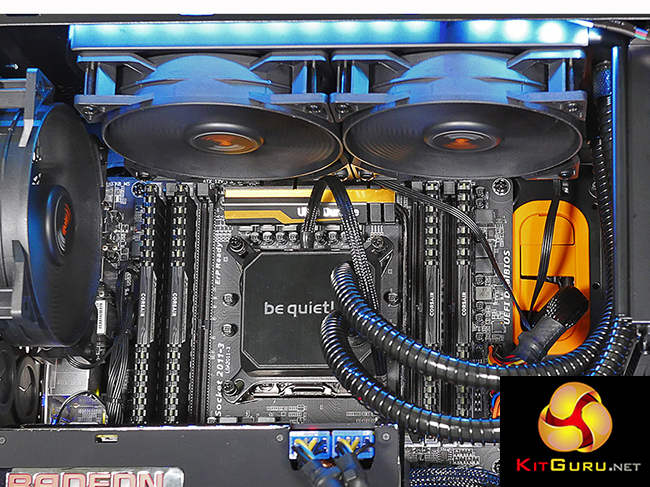 We had installed the Pure Wings 2 fans on the radiator before the assembly went into the case and this is where we found one of the detail differences that we imagine were specified by be quiet!. The mounting screws for the fans look like Alphacool’s usual button heads but actually have a Phillips head, and the same is true for the screws that hold down the water block. You only need a single screwdriver to install Silent Loop and have no need to go hunting for a tiny Allen key. Initially we connected the two fans to the supplied Y connector and then used the CPU OPT connector on the motherboard. However, this didn’t work correctly so we switched to one of the SYS headers and all was well. It took moments to install the water block on our Gigabyte GA-X99-UD4 but that’s part of the delight of LGA2011-3 as there is no backplate to faff with. 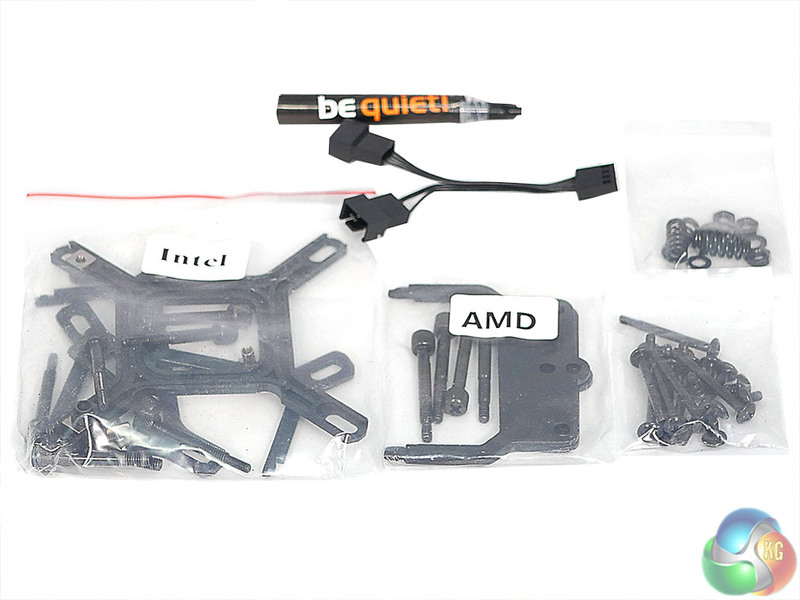 If you are using Intel LGA115x or AMD AMx/FMx you will find the necessary hardware in the accessory pack. The hoses used by Alphacool are the familiar small diameter tubes that have protective springs to prevent kinking. You can clearly see in our photos and video the hoses take a gentle radius and give no cause for concern but neither do they fight back and resist installation. 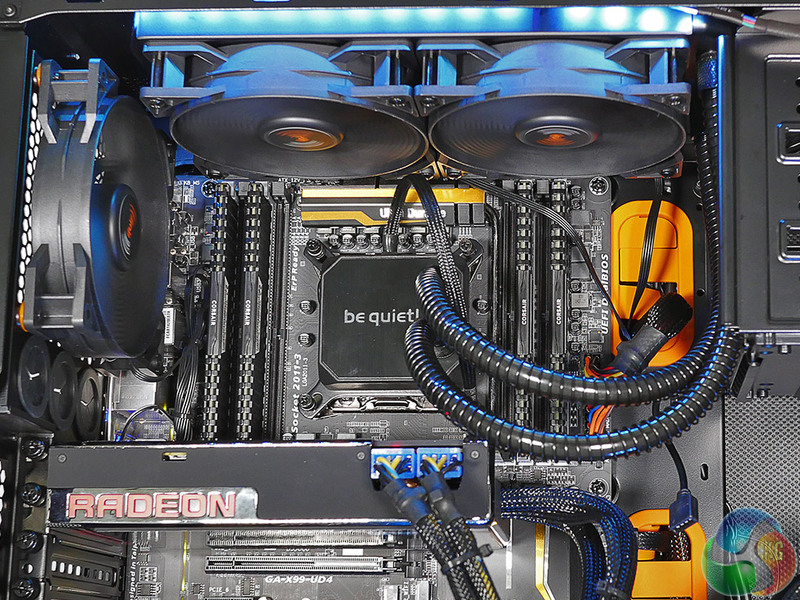 There is no USB connection or monitoring software supplied with Silent Loop, so once the radiator and CPU block are in place the job is pretty much done, apart from setting fan speed in the UEFI or BIOS. 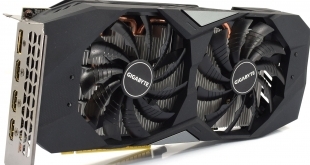 Initially we used the Normal profile in the Gigabyte set-up screen which ran the fans at 1,100rpm. This was very quiet but also allowed the Core i7-5820K to run at 55°C under maximum load. Switching to the Maximum fan speed profile gave a speed of 1,800rpm (be quiet! states 2,000rpm in the spec, which is close to manufacturing tolerance), however this was too noisy to be acceptable. We compromised at a Manual setting of 1,400rpm that was barely audible and kept the CPU temperature below 50 degrees at maximum load. Ambient temperature = normalised to 22°C. 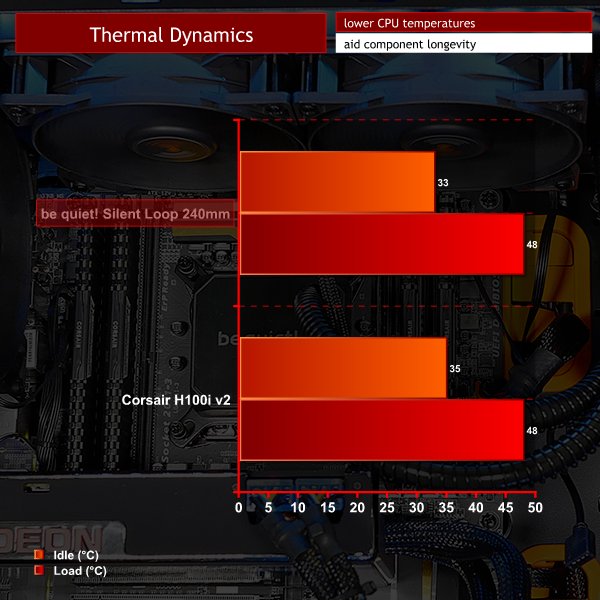 CPU temperature is essentially the same as we saw with Corsair H100i V2, however we are quite sure the more restrictive nature of the be quiet! 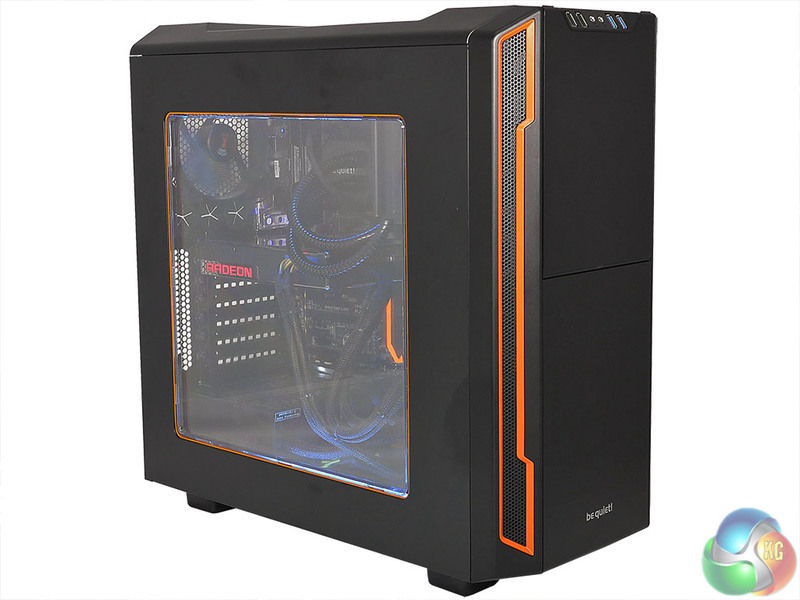 Silent Base 600 case has a small effect on the figures. That is a minor detail and to all intents and purposes the Silent Loop 240 performs equally with the ‘industry standard’ Corsair H100i V2. Turn the fans down low and Silent Loop 240 is effectively silent. The pump is very quiet indeed and we detected none of the ticking noise you get with some All In Ones. Turning the fans up to a higher speed had an immediate impact on noise and also reduced temperatures in a straight trade-off. We compromised with a fan speed of 1,400rpm that was audible but in no way offensive and were very happy with the noise levels from Silent Loop. be quiet! 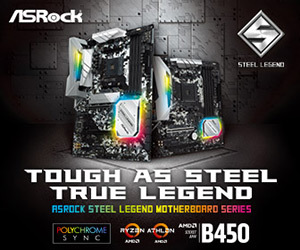 has delivered solid hardware with Silent Loop, however you shouldn’t get too carried away and think of this All In One as the basis for a custom loop. 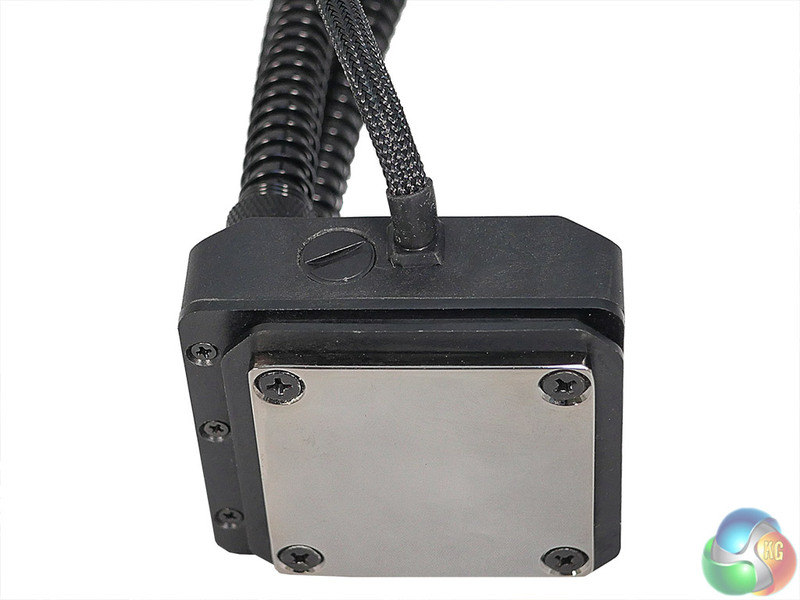 While it may be possible to add in a GPU block or a VRM block you are effectively limited by the fact the pump and reservoir are located on the water block. 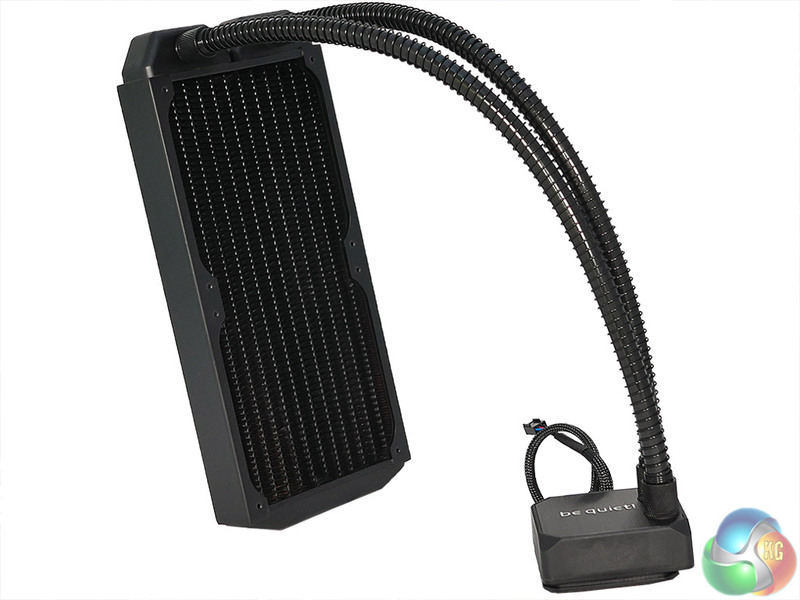 It is also fair to say the Silent Loop lacks the sophistication you get with EKWB Predator where the fans connect to a hub that is mounted on the radiator. 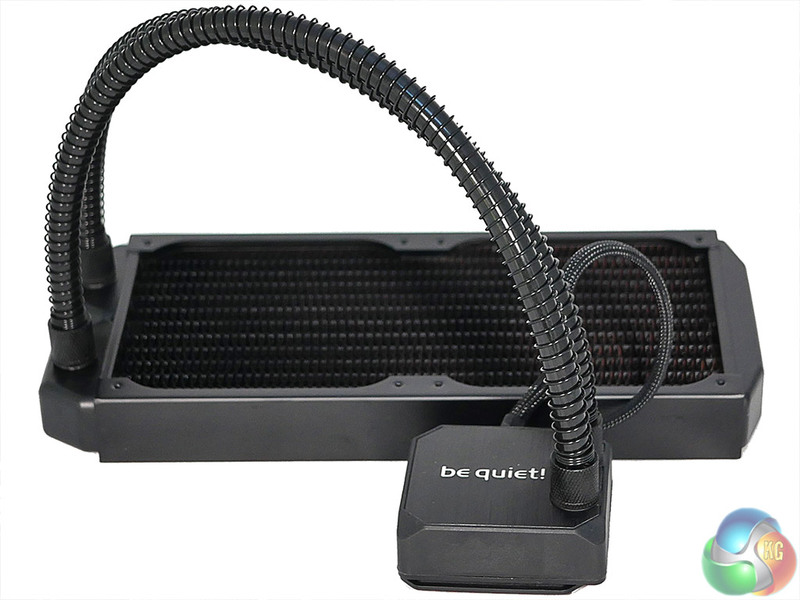 With Silent Loop you are buying a quality copper radiator and water block that have a minimalist appeal that is only slightly compromised by the need to connect the two fans and pump separately. The fact that Silent Loop doesn’t have a USB connection could be seen as a failing in some quarters but actually works perfectly well if you install a good monitoring software such as NZXT CAM. Provided you think of Silent Loop as a minimalist All In One that is built on solid engineering, and you are happy to pay a small premium over Corsair H100i V2, then all is well. On the other hand, it is tricky to put your finger on a single aspect of Silent Loop that beats the opposition and makes it a winner. Certainly it works well and is very quiet indeed but probably the simplest test is to ask what you think of the aesthetics. 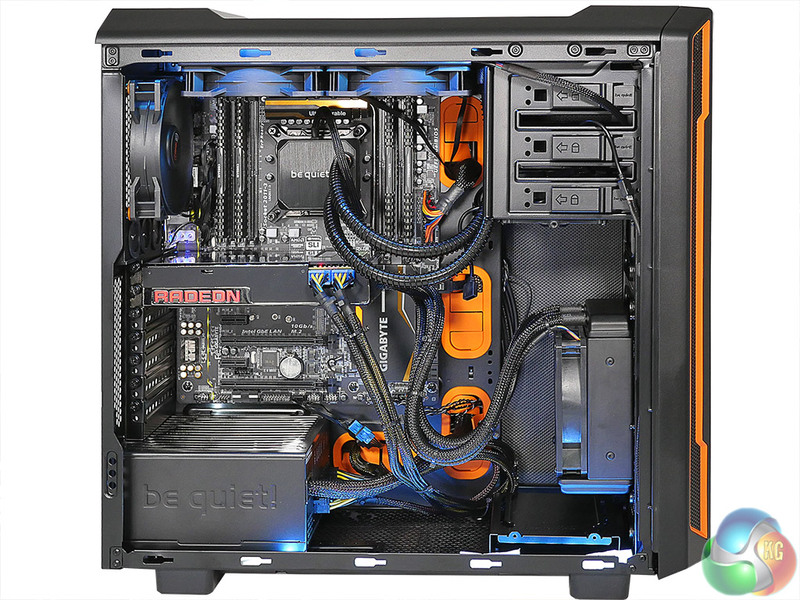 If you like the looks of Silent Loop compared to its competitors, we suggest you buy it. One thing is certain, if you make that choice we are confident you will not be disappointed. The be quiet! 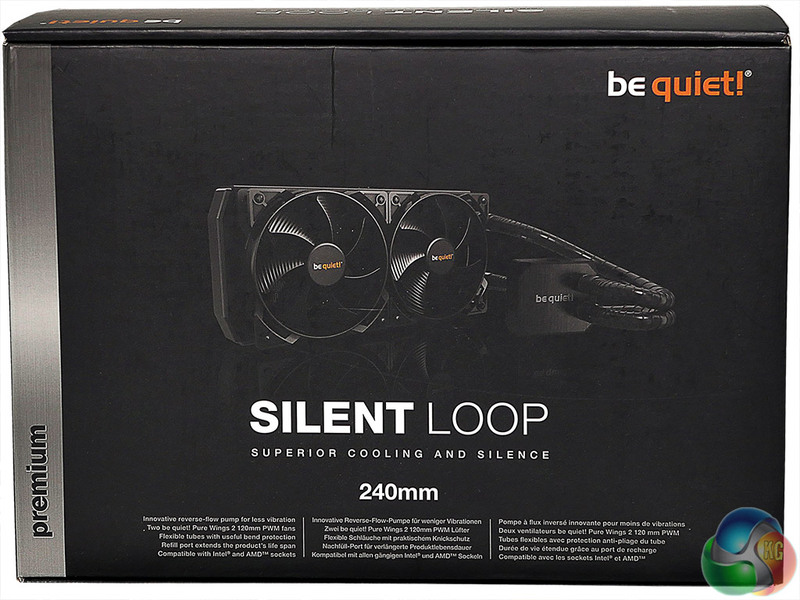 Silent Loop 240mm Liquid CPU Cooler is available at Overclockers UK for £114.95 inc. VAT. The other sizes are also available at £94.99 (120mm) and £129.95 (280mm). Copper water block with nickel plating. Water tubes are flexible and have bend protection. There is no realistic option of expanding the cooling loop. Cooling performance is unexceptional against its competitors. 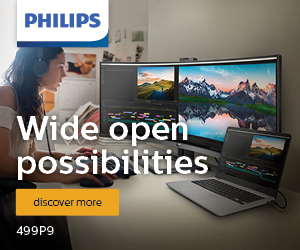 You don’t get a USB connection or any monitoring or control software. Pure Wings 2 fans use rifle bearings rather the Fluid Dynamic bearing you get with Silent Wings 3. 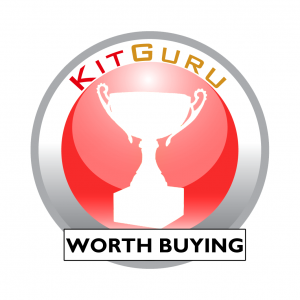 KitGuru says: be quiet! Silent Loop looks smart, works well and is very quiet.